ART i ESCOLA is a programme to promote and highlight the presence of art in the schools. ART AND SCHOOL is promoted by ACVIC Centre d’Arts Contemporànies, Centre de Recursos Pedagògics d’Osona, Escola d’Art i Superior de Disseny de Vic, Fundació Privada Osona Formació i Desenvolupament, H. Associació per a les Arts Contemporànies, Materials Educatius, Morir de Frío, Idensitat, Pakdart, Universitat de Vic, and interested individuals, and each edition is developed jointly with participating nursery, primary and secondary schools . The initiative establishes a network of partnerships among different organisations working in the field of art and education, in conjunction with schools. It is based on the premise that education is a part of cultural production, and that the arts, considered as a multiplicity of contemporary forms, may provide several useful tools for revitalising educational activities. The team members forming part of the working group are linked to participating organisations, and are tasked with setting out the programme's guidelines, as well as with advising participating schools on content and methodology. At the beginning of every school year, an open call is issued to find participants. 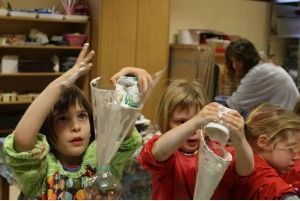 The ART AND SCHOOL programme aims to encourage collaborative processes, to learn what is happening in schools in relation to the arts, to share these happenings, to combine approaches and methodologies among those involved, and to bring into schools those elements which form part of current cultural debates. The arts, therefore, rather than being simply lessons in handicrafts, become an instrument for building knowledge relationships,. In each edition, a sufficiently broad theme is set in order to encourage work from many different fields such as the social sciences, the natural sciences, the visual and sculptural arts, technology, mathematics, computing, etc.. Moreover, the project may take the form of an interdisciplinary project, working in different areas and/or subjects. Using any medium, for example video, photography, painting , drawing, sculpture, installation, and also in relation to other arts such as advertising design, new imaging technologies, cinema, architecture, etc. Subjects in previous editions were: environment, time, the net, light. The 2015-2016 edition will work around the concept of void. At the beginning of each school year, there is an open call among teaching staff in nursery, primary and secondary education, with the involvement of teachers from various subjects. Entire schools, a year within a school, or a single class-group, may participate. The registration period for the 2015 – 2016 school year has concluded. Each participating school will determine the length of time to be devoted to the process. There will be a minimum suggested duration, so that a coherent work which includes a work process, methodology, references and outcomes, may be advanced. Projects must be concluded by the end of second term, in the week before the Easter break. • The consultant team will meet regularly with the school. There will be three tutorial sessions. • Depending upon a participating school's particular needs, and if deemed necessary by a school's teaching staff, an advisor may be contacted during the process to schedule meetings. • These advisory sessions on methodological processes are aimed at teachers, not pupils. a) A space of communication, where pupils may explain how they carried out the project. b) An exhibition of the work process and results in ACVic Contemporary Arts Centre. c) An exchange day between participating teachers, with the objective of discovering and sharing different working methods, in order to enhance future educational practice. d) The Art i Escola website, which includes graphic documentation of each project provided by participating schools. We believe that this theme may be studied from many different fields, and in many different aspects, because it may be understood in its physical basis, as well as in its philosophical concept. What is the void? How to study it? Through sculpture, in its physical nature. Through the sciences or through mathematics, we may analyse a void. We can see emptiness, we can perceive it. Space, place, landscape, architecture, implies emptiness. The void may also be studied through values, ​​emotions, sociology. Is Modern society full? What does the individual need in order to live fully? You can talk about human needs, solitude and simplicity. In the universe; the atmosphere, the stars and their movement, their relationship. It could be a game, and a relationship between opposites. The void is full, which therefore means matter, form, content and container. The revolutionary discoveries of quantum physics say that matter is composed of "nothing" at 99.9%. The void is most abundant in the universe and inside atoms. Is the void still, does the void move? can the void be seen? can the void be heard? This year the programme started with a presentation at ACVic. Carme Collell, Art HIstorian and Ceramist, made the opening session focused upon the subject of the programme.